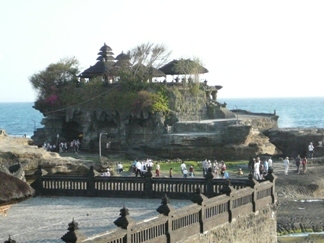 Pura Tanah Lot is very popular as a tourist destination for the foreign tourist, also for Indonesian people is this place irresistible. I still admire this temple every time I visit this place, it’s like you’re in another atmosphere, especially at the sunset. This place is located about 20 km from Denpasar, at the village of Beraban in Tabanan Regency and easy to reach if you use public transportation. The easiest way is of course to hire a car. 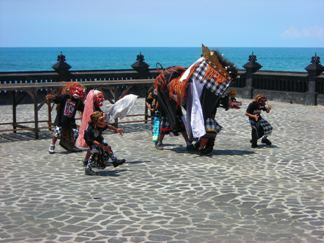 It’s about 20 minutes drive from International airport Ngurah Rai. 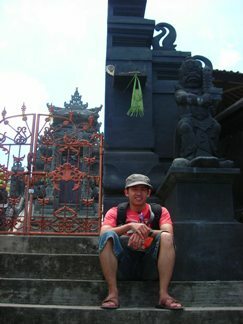 This temple is one of the most important temples in Bali. That’s not really surprising why this temple such a popular location, and if you were there, you would understand why this place is so crowded, especially just before the sunset. The view is truly breathtaking, simple but sensational at the same time. Tanah Lot setting is really amazing. Simple in construction but spectacular. 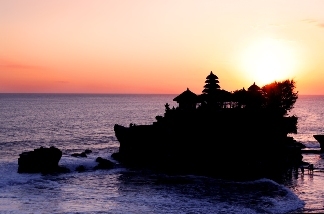 The Temple sits on a huge offshore rock which has been shaped endlessly by the ocean tide. You can walk to the temple only at low tide. There is a path down to the sea. 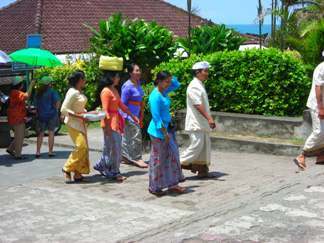 But if you are not Balinese, you’re not allowed to enter the temple. If you want to avoid the crowd, just choose the right time. Before noon is might be the best time to visit. Not many people visit around this time and you can fully enjoy the beauty of this temple. You can go up to mainland cliff tops to enjoy the sunset view from the restaurants or bars, some of expensive restaurant settings on the rock formation with a beautiful view over the area. The most people stay under, so if you want more peace while you’re enjoying the sunset, just go up, the view is priceless. 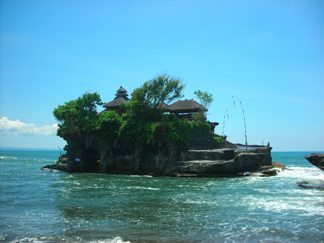 Tanah Lot means the small island floating on the sea. This is truly the right name, you can see when the tide is high, it looks like that the temple really floating on the sea. According to the legend, this temple is the work of Nirartha, 15th century priest. During his travel along the south coast he saw the rock island’s beautiful setting and rested there. And later he spoke to the fisherman who came along, asked him to build a shrine on the rock to be a holy place for the sea gods. And people still believed that the temple is still guarded by sea snake which created from Nirartha’s scarf. Until now you can still see that are many caves under the rock full of sea snakes.